The scandal at the epicenter of The Wicked Wives is told in its entirety from beginning to end, though not in exact chronological order. The first portion of the novel provides readers with the stories and backgrounds of each murderous woman and DiSipio himself, then segues into Rossi's eventual arrests of the women and men involved, and their trial. With an extremely procedural tone, The Wicked Wives reads more like true crime non-fiction than an actual novel. This portrayal is mainly due to a lack of the "show, don't tell" writing technique; however, the novel is very accurate in terms of courtroom and investigation procedures. 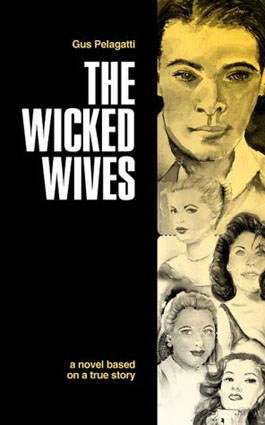 Readers and fans of true crime may be able to forgive the novelization of The Wicked Wives, and appreciate the novel for its historical relevance to the true story on which it is based. For a novel that takes place during the 1930s, The Wicked Wives seems to lack the noir that is often evident in film and literature set during this time period; however, the cultural conflicts between characters are very spot-on and affecting. I definitely recommend The Wicked Wives to fans of true crime, and to fans of lawyer and police-procedural crime novels. Seasoned readers looking for a suspenseful thriller may not be surprised with the crime as it unfolds throughout The Wicked Wives. If you liked The Wicked Wives, you may also like Before He Wakes by Jerry Bledsoe and Heart Full of Lies by Ann Rule, both of which are true crime non-fiction books about women who murder their husbands. If you enjoy reading crime mysteries of the 1930s noir, try the first 2 novels in the Haunted Bookshop series by Alice Kimberly, entitled The Ghost and Mrs. McClure and The Ghost and the Dead Deb. What are your favorite true crime books? Share your thoughts with us in the comments below. I saw this book and the authors comments on amazon.com and decided not to buy it after all. I dont want him to sue me if I dont like it lol.